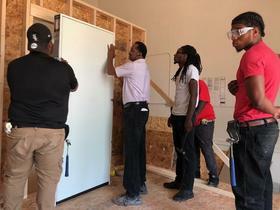 Some Rochester residents who dropped out of high school, served time in prison, or simply struggled with establishing a career, are learning the skills of the construction trade. Andy Evans, a master builder with years of experience, is offering classes in a former church on Buffalo Road in Gates. Evans said someone once taught him how to do this work when he was younger. "I was at a part of my life where I could have gone down the wrong road," he said. Now, Evans wants to help young men who haven't found a good paying job or a career they like. Lenzy Blake dabbled in construction a while ago, but had to give it up when he hurt his arm. Now that he's recovered, he wants to start over and find a job in one of the trades where there's a labor shortage. "We're learning everything here," Blake said. "We're pretty much building a house from the ground up. We're starting from the basement all the way up to the roof and electricity. It's going to get us well-rounded for the future." Andy and a couple of his partners used their own money to start the training center. Some local companies have donated supplies and the tuition for some of the students was covered by a local program. The Rochester Construction Training Center would welcome more community support. Click on the LISTEN link above to hear more.